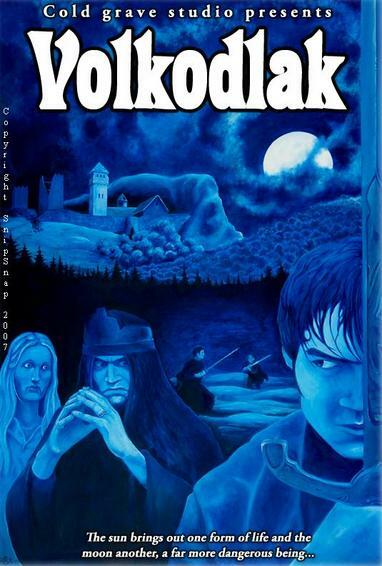 Volkodlak, a little vampire opus that's straight outta Norway, might trick you into thinking you've taken a trip in the Way Back Machine and landed in a much simpler time in horror history. This 25 minute silent film sets out to present a horror story that would have been right at home a hundred years ago, and achieves some success. While this is certainly a low budget affair, the first thing that leaps from the screen about Volkodlak is a booming musical score that really makes the film feel grand. It's a tad overbearing at moments - with no dialogue you kind of have to fill the air with something - but when it's at its best the film sounds like it would fit in with Nosferatu (or at the very least a Castlevania video game). When this music is combined with some classic shots of the moon or the dark countryside, the film hits its highest highs. On the flip side of the equation, Volkodlak loses some of its antique charm at times. I particularly struggled to accept the film as it got closer to its actors, because the young cast look more at home in our time than they do in classic horror cinema. It's a minor beef - it's not like there are any young actors of 1915 around and still young- but it did take me out of the film in a few moments. The costumes and makeup didn't do a lot to hide the actors' modern images in close shots (probably a budget issue, which I get) so the film did lose a little of its edge with me in some scenes. Aside from minor stylistic concerns, it's the simple plotting and authentic visuals that accomplish most of Volkodlak's goals. The filmmakers mimic the silent era as well as they can, and wide shots of the characters moving through the castle combine with the exterior and setting shots to really hammer home the feel of a classic vampire tale. The plot is very basic - one Count, one swordbearing dude, and one girl are the main cogs - but it is exactly the kind of story this kind of film needs. There's a little bit of violence and a little twist as the plot moves on, but the visuals are really what we're here for and they don't disappoint when they matter. On another positive note, the production doesn't feel like it's trying too hard to point out its influences or wink at the audience; an area where many filmmakers who want to pay an homage to past films lose their way. Director/star Bjorn Egil Eide might be guilty of taking his film too seriously at times, but I'd rather have a film that leans too far in that direction than one that turns in to one big joke. Volkodlak is incredibly raw and might not look just like something from the silent era, but it does more than enough in its better moments to make up for some of my nitpicks. The film is probably best viewed as an amateur experiment in horror, but I think that fans of silent horror will find some positives in this short tale. If you'd like to try Volkodlak out for yourself, here are the links to part one and part two of the film on YouTube. If you like what you see, be sure to head on over to let the fine folks behind Volkodlak know by commenting and/or liking the videos. And, of course, if you're still not sure, hit up the trailer below.